Where is integration in the refugee crisis? This is the subject on which Professor Jenny Phillimore spoke at the City Of Sanctuary meeting I attended last in Birmingham. She spoke of the three stages of integration: Reception, Orientation and Social mobility, and how research shows that failure to properly engage with new arrivals can contribute to their ill health and failure to thrive and integrate. As we have discussed, one of the principal problems refugees have to be helped with is their profound sense of loss. Among the key ways to help newcomers integrate is help with language, advice about local rules and regulations, including such mundane matters as which colour bins to put out when, and how to recycle, and allowing them, if possible, to have some say in their accommodation. Age appropriate mentoring and buddying schemes are also helpful. Also, among a group of refugees are likely to be people who have specific skills and qualifications. Finding people in the community with similar skills and qualifications with whom newcomers can share their knowledge can contribute to a feeling of worth. I am more and more convinced that it will be necessary for us to access instruction in how to engage with people appropriately and with regard to their needs. BROMSGROVE Muslim Community Trust (BMCT) has condemned the actions of those who carried out the horrific attacks in Paris which have left almost 130 people dead. French President Francois Hollande said last night’s shocking shootings, bomb blasts and a hostage siege, were organised by the Islamic State (IS). Following the massacre and the claims about who was behind the attacks, members of the BMCT contacted The Standard. A statement by chairman Dr Waqar Azmi said: “We are deeply shaken and appalled by the horrifying Paris attacks and our deepest condolences are with the family and friends of the victims, and the French nation. He urged people of all faiths and those with no faith to stand firm in unity and solidarity. “We must not let these terrorists divide us, otherwise the terrorists will win. “Let us not play into their divisive narrative, and instead show them that people of all faiths and none can live peacefully, together. “Like the terrorists who want to divide communities, there will be some in the days ahead who will try to use this atrocity to attack innocent people. “We equally reject their intentions. St Peter’s Church Hall was full on Wednesday October 28th when more than 60 people attended the second meeting of the BRWR group to show their support. 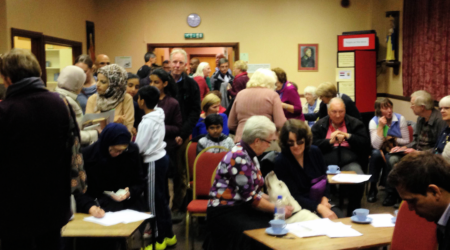 We were a diverse group of residents from local churches, schools, Muslim and Arabic communities, from all over Bromsgrove district, Northfield and Rubery. 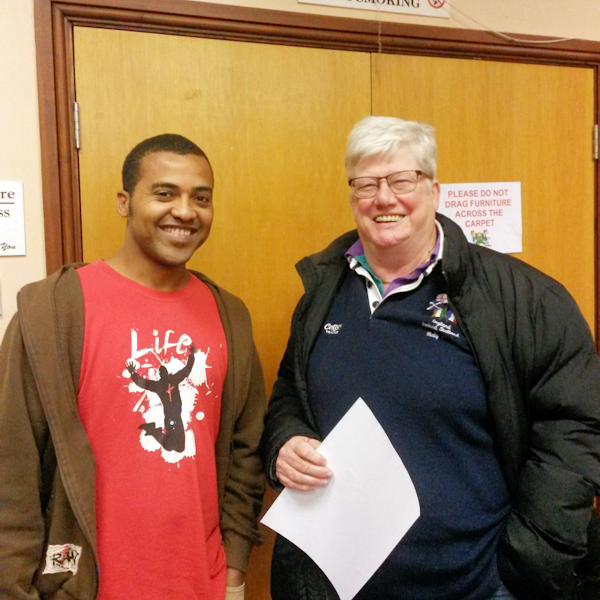 Several members came from the Equality and Diversity Forum. A brief history of Syria was given by Janet King. Later 2 people with Syrian parents who had fled from the war there in the 1980s, explained a little more, and Hassam offered Arabic tuition and books. A young Christian Eritrean refugee who had travelled through Calais, described how he was now studying A levels and thanked us for his welcome here. A website is in process of being designed by Peter Rendell and Dr.John Cochrane asked for help with publicity. The group has a constitution and a bank account for financial transparency. Several people made themselves known with offers of help, whether it was teaching English, or befriending, donating furniture, bedding, etc. Storage of goods will be needed until BDHT could identify properties where refugees could live. It was suggested that the empty library building or council offices could be used for furniture storage. New Starts have offered the use of their van and driver to transport furniture, but are unable to store any for us. The big question on everyone’s lips was, when is this going to happen – how soon can we welcome some of these very vulnerable people from the refugee camps and how many will the council agree to take? We understand that it is up to 12 or 15 families. Will they all arrive at once, or gradually? Many other authorities are making offers now also. It was agreed that we would write to Bromsgrove District Council officers urging them to accept some refugees before the winter. The 1 year’s funding already agreed by the government is actually from the UNHCR and the Overseas Aid Budget which is only 0.7% of GMP. It was agreed that people would also write to their MP, Sajid Javid, who so far had been very positive in his support for the scheme, asking for him to put pressure on the government to agree to 5 years’ funding for the refugees. We understand that when the District Council is more certain of a government pledge, then they will progress the scheme. The refugees will not be barred from working to support themselves, unlike asylum seekers, so may become productive members of society within the five years. Coventry, has been brave enough to go ahead with accepting 78 refugees without this pledge of government money. 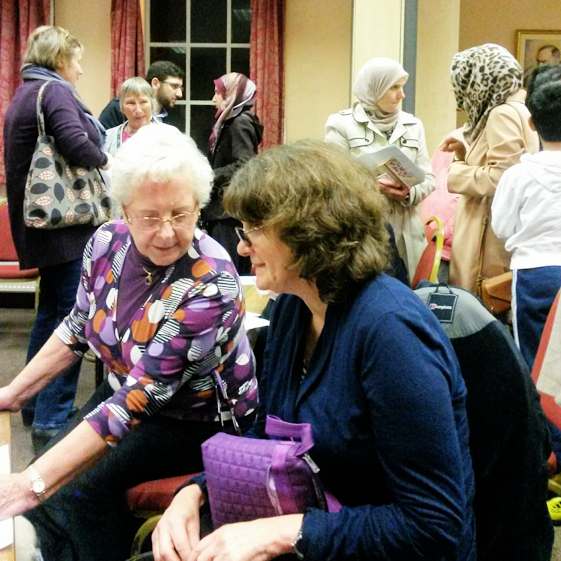 Following the very welcome news from Bromsgrove District Council and Worcestershire County Council that refugees under the Vulnerable Person Relocation Scheme (VPRS) will be welcome in Bromsgrove, a group of us met in Bromsgrove on the 30th September to form a community group called ‘Bromsgrove & Redditch Welcome Refugees’. The idea of this group is to give community support to our local district and county councils in this worthy, deserving cause. The common feeling amongst this group is that we want to reach out and support the few thousand refugees who will be coming from refugee camps to the UK having fled such a devastating conflict, leaving behind nearly everything they owned. 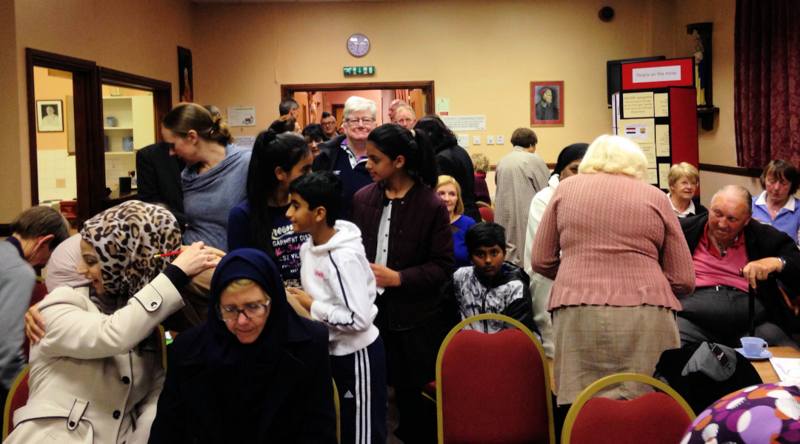 Since the group’s formation, we held our first public meeting on Wednesday 28th October at the Community Centre, St Peter’s Church, Rock Hill. More news about this to follow soon!